Next, enough crumbled parmesan to make you happy. Some salt, a couple of twists of fresh ground pepper and finally, a dash of the best balsamic vinegar you can find. I use the one that's aged 5 years. You can find older vinegars but they tend to be too sweet and are best kept aside for an occasional dipping pleasure. That's it; a perfect lunchtime salad! Looks delicious. 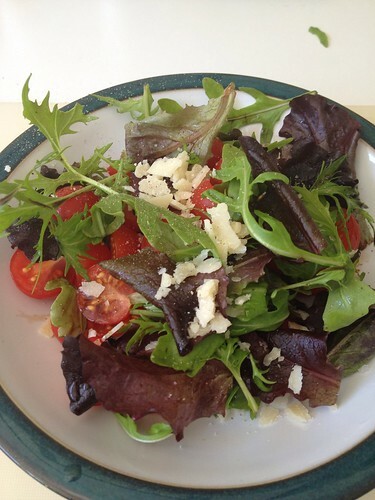 Sometimes, I go through the salad eating phase and I feel like having them everyday.Enjoy!